Following the latest upgrades and advancements of customer relationship management software systems, we have updated this article with the current information on 2019’s leading online CRM tools for your business. Which is our most reliable source of truth when choosing technology? Regardless of what we need and expect, we’d all point a finger towards customer reviews, as there is little chance for software that worked well for hundreds not to exhibit the exact positive effect for us. Of course, we’d not always be 100% right in doing so, but the bonus trick to learn from this market trend is that our main priority is treating customers as market leaders do. What does this mean? Better yet, do CRM systems indeed make such a difference? We like to think of managing customer relationships as a treasure quest, not only because it tackles the people you’re trying to sell to, but also as these are the people that will teach you how to sell to everyone else. And while it is true that most businesses employ lead management systems and marketing tools to take over the process, much of the heavy lifting still belongs to CRMs: Rather than historical views, customer relationship systems extract futuristic information from your revenue streams, and enable you to depict opportunities, follow trends, and put affront the practices you’re proud of. Over the years, the acquisition of customer relationship management tools has been steadily increasing. In fact, according to a report by the International Data Corporation (IDC), the CRM applications market grew by 16%. 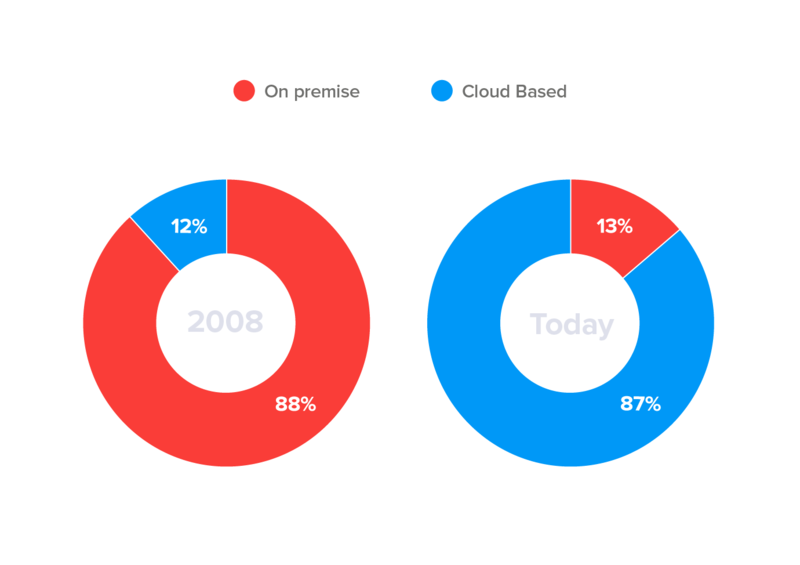 What is even better is that CRM systems are among the fastest adopters of the in-cloud enterprising trend, and will thus break even for small and on-budget performers. How do you know that a CRM tool will work for your business? There are many factors you should consider, starting with the number of customers you wish to manage, and moving towards the metrics your ideal CRM should reveal. To make the process less time-consuming, we prepared a list of 20 best solutions. 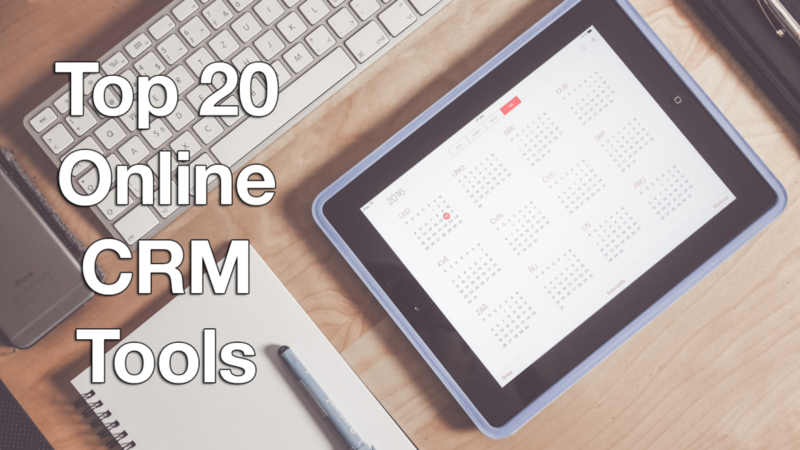 What are 20 best online CRM tools your company can benefit from in 2019? Across the expert community, HubSpot CRM is known for being the best (and probably only) free-of-charge yet do-it-all CRM to have appeared on the market so far. Ever since this powerful CRM platform pleases users with modern features and never-ending innovations, and packs all lead organizing, tracking, and nurturing faucets in a friendly kit that doesn’t cost a dime to obtain. Its target audience is inbound sales teams looking to graduate from messy spreadsheets and cluttered inboxes, and such that demand total visibility into their customer interactions. HubSpot CRM works in synergy with other HubSpot products and puts in place interesting connectivity possibilities that could cater to your software infrastructure. The same as other products discussed on this list, HubSpot CRM is hosted entirely in the cloud, and thus imposes no complex setup or maintenance concerns. All you need to do is to subscribe for their service (once again, it’s free), and you can start improving your sales practices since day one. You can easily get HubSpot for free here. Lifetime Free packages for small and developing businesses. Any business, regardless of its budget, can use HubSpot CRM at no cost and integrate it with just as many business systems and applications as necessary. The free package wraps up all essential CRM features and doesn’t restrict the number of users or contacts you can import. Universal applicability across all of your sales channels. Modern retail businesses operate in many different channels and locations, and HubSpot CRM brings all of their processes together. For the first time, you will be able to manage sales operations conducted via websites, email service providers, social media profiles, and phone calls from the comfort of a single dashboard. End-to-end pipeline management. HubSpot CRM will help you close more deals with less work involved, because it organizes and tracks each aspect of your sales pipeline, and helps you close deals successfully and in time. No limitations on storage and contacts in your database. With HubSpot’s free CRM, you can enjoy as much as 1,000,000 contacts and users, and unlimited storage. On top of that, you get to tweak the system’s functionality in line with your business requirements and customize it to your wish. Automated data enrichment. HubSpot CRM offers some of the most powerful data enrichment functionalities, thanks to which you can import leads from your emails with a single click. Another way in which HubSpot CRM perfects the art of efficient customer relationship management is with fast leads backlog, and the intuitive interface that doesn’t require any training or complex installations to master. Neat organization and management of your leads. HubSpot CRM is a restless and powerful automation system, which will eventually help businesses close deals faster and cut the time they are spending on arranging customer documentation. Using it, you can sort your won and lost deals, and arrange them by stage, names, owners, and amounts using custom fields. Personalized requests, sequences, and email templates. HubSpot CRM makes it possible to queue up emails and schedule them for delivery, using any of the system’s beautiful premade templates, or creating such from scratch. Salesforce is another business software provider we’d easily entrust our CRM operations. With a dedicated CRM package in place, Salesforce dominates a large portion of this market, providing a variety of unique services such as lead management, marketing automation, and partner management combined with neat sales data control. Salesforce Essentials also stands out because of its real-time views of your sales team’s conversions that help you create adaptive weekly forecasts. You can also use the system’s top-notch reports to accumulate data for detailed reporting and analysis, and manage territories with the right model to set boundaries and customer volume and achieve more balanced assignments among your reps. Sign up for Salesforce Essentials free trial here to explore the software firsthand for 14 days and help you determine if it matches your needs. Very competitive opportunity management. Salesforce Essentials incorporates a special Sales Collaboration and Sales Performance Management module, both developed to help you set metrics-based goals and amplify winning performances of sales reps to motivate a healthy competition in your team. Active generation of quality leads. With Salesforce Essentials, you can generate quality leads and cuts the duration of your sales cycles in advance. This system makes it possible to track clicks and create smart campaigns, and offers dedicated Marketing automation and Lead management apps to help you control your customers’ journey. Customizable business processes. Salesforce Essentials’ Visual Workflow lets you drag-and-drop and edit business processes with ease, including even deals, discounts, and expenses. The very same tool can be used to share and sync files and track changes in real time, and to improve communication between team members. Detailed analytics & reporting. As it is the case with most Salesforce products, its CRM’s intelligent dashboards are able to collect and accumulate data for detailed reporting and analysis. Using the right model, you will have the possibility to manage territories, set boundaries, and customer volumes, and assign leads between reps with unparalleled precision. Engaging customers wherever you are. Salesforce Essentials offers dedicated apps to Android and iOS users, and thus allows your reps to engage customers and use opportunities even when out of the office. As a truly mobile-optimized system, Salesforce Essentials imposes no restrictions on the types of devices or operating systems your team members will be using. Much of Freshsales’ path towards customer’s attention was already paved by Freshdesk, the immensely popular flagship product of the company that collected experience to build the ideal CRM solution. As a result, Freshsales is one of today’s most preferred sales-centered CRMs, and profitable member of the well-known Freshworks productivity suite. Users are particularly fond of its intuitive interface, AI-based lead scoring, activity & behavior captures, and other unique features. Freshsales will work the best for small and medium sales teams, including such that have no previous experience with digitized customer relationship management. Last, but not least, you should consider this product because of its smart email management capacity, and the number of prominent names contained on its list of partners and integrations (full compatibility with all Freshworks products). If you’d like to see it in action first, a free trial for the product is available. You can easily sign up for Freshsales free trial here. End-to-end email tracking and management. With Freshsales, reps have the possibility to track emails and see whether the recipient has opened them or not. They will also be to send bulk emails drafted on personalized templates, schedule those and sync them with their calendars, or relate them automatically to their contact records to export all relevant information. Advanced contact segmentation. Once you run the system, you will discover a neat timeline where contacts are segmented on the basis of their behavior, and listed with all emails and engagement information to let you score them easily. This way, you will be able to appoint meetings, and peak within the contact’s history while you’re communicating with them, discover what has indeed piqued their interest, and how they interact with your product. 360-degree overview of all customer details. Freshsales will provide you with a 360 degrees-view on all conversations and relevant details, and the advanced differentiation between pending won, and lost deals. Drag-and-drop sales management. Freshsales will make it easy to sort and filter close dates, distinguish bestsellers, and make sudden changes for all actions. It is where the system’s handy drag-and-drop navigation is most useful: in few seconds and with few moves, you can customize follow-ups, analyze wins and losses, identify trends, or spot bottlenecks that have been slowing your performance down. Modern analytics suite & trendline reporting. Freshsales makes it possible to build custom reports for every contact, deal, or opportunity. All of the reports can be generated at any point in time so that the user can summarize information when changing the course of his campaigns. Developers have recently expanded their modern analytic suite with sales activity and trendline reports, which give users the full picture of how their sales strategies are progressing. Pipedrive should definitely be one of the first CRMs to consider for improved sales and service delivery practices. It represents a system we foresee striking some amazing results in an environment where applied. Pipedrive is a sales and success-focus CRM with a variety of advanced features that attracted over 50,000 companies worldwide. All of the system’s functionalities are constructed around a simple active-selling logic, providing users with adept control over deal completion and lead nurturing. One of the methods Pipedrive uses to build healthy and lasting customer relationships is absolute visibility within every deal, tightly connected with the possibility to create and manage records without the usual administrative burden traditional CRMs impose. In fact, you will be pleasantly surprised by Pipedrive’s modernity wherever you turn, as each and every feature is painless to manipulate, and follows a minimalist, clutter-free approach to sales optimization. Pipedrive is best known for automated alignment of activities with long-term missions, closing the critical functionality gap many large teams could stumble upon. The system also offers accurate reporting and analytics, sales forecasting, and integrates with a variety of leading service providers to help you adopt it in less than no time. A free trial is also available for users interested to test its features. You can easily sign up for Pipedrive free trial here. Customizable Web Forms for simplified lead collection. Pipedrive collects contact information using customizable Web Forms, which can be placed directly on the user’s website or newsletter, or created manually within the Settings section. Effective management of direct sales. Pipedrive’s smart Timeline View allows you to select the right deals and activities to focus on, and close them faster. Adding deals is made very simple, with a pop-up information box where you can add associated organizations, closure expectancy dates, stages, scheduled activities, and other important details. Activity scheduler for your events and meetings. The feature makes it easy to plan events and appoint meetings in your calendar with no risk of double entries. There will also be a dedicated Mail tab where you can sync correspondence from several different accounts, forward documents and close specific deals with contacts that are not displayed on your Pipedrive list. Bulk editing is also an option. Shortcuts to more successful deals. Pipedrive is a very customizable and collaborative system and thus lets you modify your sales pipeline stages according to specific business needs. You will be able to turn on/off entire modules, add and remove fields, personalize messages, and share all sorts of files you believe could be useful to your colleagues. Top notch analytics & reporting. Pipedrive stores all conversations and relevant information in a centralized database, from where you can export it to other systems, or use your own app to pull out detailed summaries. You can also give the Live Dashboard a look, and follow the status of your Wins, Loses, People, Activities, and Newness, or customize a special report that will display all aspects of your performance. Streamlined mobile experience. Pipedrive is fully optimized for mobile usage and offers dedicated apps for Android and iOS users. All data is automatically synced and backed up in real time on a separate server. An array of useful integrations. Pipedrive offers an open API configuration and comes with a very large list of premade third-party software integrations (including prominent CRM, accounting, marketing, and sales tools). You can also use it in synergy with Google Suite products and various email service providers, and connect it to Zapier for your own, custom integrations. Availability in multiple languages. Currently, Pipedrive is available in even 13 different languages to serve almost all geographies and works with a wide range of currencies including leading and minor ones. Zoho CRM is an online customer management solution that helps companies improve their selling strategies, and engage potential buyers across different interactive channels. The product belongs to a larger, very popular productivity suite which also guarantees its ease of use and synergy with multiple Zoho and third-party apps and systems. Zoho CRM will not only help you streamline communication with clients, but also understand the metrics you’re collecting, and analyze and pull off valuable customers’ life cycle reports. You will also like how customizable it is, as it will easily adapt to your business specifications, and let you decide how to collect and use data across the organization. You can easily sign up for Zoho CRM free trial here. All-in-one sales automation suite. Zoho CRM automates daily sales tasks, converts web visitors into hot leads, imports prospects from external sources and parties including trade shows, direct emails, and seminar. Once imported in the system, your leads are instantly matched with the appropriate sales agents, and their profiles are open to any type of editing or modification. Accurate revenue forecasts based on current performance. Zoho CRM can be used to accurately forecast revenue, establish/assign/edit sales quotas, identify individual/team performance, measure forecast accuracy, and create customizable forecast reports and dashboards. Social-media-first CRM. Zoho CRM makes your products and services more visible on all leading social networks, helping you collect leads and connect with prospective customers. You can use it in synergy with Facebook and Twitter. Targeting and re-engaging inactive leads. Zoho CRM uses advanced features such as Business Card View and Notes to display the time and content of past conversations for a more personal and purposeful communication. With all information organized and displayed, you can identify and target inactive leads with historical data and realign your customer messaging. Full customer control from a mobile device. Zoho CRM has a special, dedicated mobile edition for Android and iOS users which helps stay in control of customers’ actions even when out of the office. bpm’online CRM is a member of the company’s end-to-end sales and marketing management bundle, developed to streamline communication between different departments. The process-driven solution helps you manage your customers’ complete lead-to-order journey, ease interaction, and keep accounts regularly updated; and relies on 13 years of best-of-breed experience that caters to the needs of starter companies and enterprises. The highlight of bpm’online’s functionality is definitely impeccable service – at the moment, the company employs 600 experts and serves over 6,500 customers worldwide, and prides itself with several great industry awards including our Useful Free Trial and Great User Experience Award. If you’d like to try it out first you can easily sign up for bpm’online free trial here. A unique combination of CRM and BPM features. bpm’online CRM brings under the same roof a variety of useful CRM and BPM features, including close observations on customers’ buying behavior, sales forecasting, design, tracking, and management of business processes, and in-depth analytics. Code-free customization. bpm’online CRM is an easy-to-customize system, which offers a special wizard to add objects, fields, and links; an integrated component library to customize without coding, and processes to change business logic. The RIA interface is also open for adjustments and uses AJAX and Silverlight technologies to improve customers’ experience. Agile deployment. You can deploy bpm’online CRM as SaaS or on-premise, and consequently, agree to an annual subscription or a single-time license to cover for the service. Customer Success Management program. At no additional cost, bpm’online CRM users will be entitled to a dedicated Customer Success Manager who will assist their onboarding process, and help them improve the quality of their customer service and lead nurturing practices. Very agile CRM processes. Bpm’online offers the agility to continually test, modify, and improve processes to stay tuned to the new business environment. There are no interruptions of the user work when a process needs to be updated. This also helps with the process modification and testing in response to the immediate needs of the business, on the fly and in the cloud. Copper is an easy-to-use CRM that doesn’t require training and complex installations, and one of the industry’s top performers currently recommended by Google. As developers like to put it, Copper is ready to apply by all current Gmail users, as it collects sales and leads data automatically, and arranges it in a way that closely resembles Gmail’s intuitive interface. The software will help you boost the productivity of your team in many different ways, as for instance eliminating manual data entries, automating tasks, tracking your employees’ activities, and managing multiple sales pipelines at once. Also, it integrates with other G Suite products to let you migrate data seamlessly and with minimal effort. The vendor offers a comprehensive free trial to get you up to speed with the features. You can sign up for Copper free trial here. What is unique about Copper? Centralized communication with your customers. With Copper, communication is completely centralized, and neatly arranged in customer profiles packed with information and conversations. You can automate tasks, send and track emails with ease, and make use of the system’s collaborative nature to keep the whole team involved in the process. Integrated, ready-to-use VoIP functionality. Copper integrates with the RingCentral VoIP suite to trigger quick-to-dial and call logging functions for an even easier communication with your customers and partners. Detailed pipeline reporting. Copper comes with a powerful reporting suite that will help you understand the effects of each practice. Regardless of the number of clients you need to serve, Copper will set dedicated business pipelines for each, and make your sales approach more direct and personal. Accurate goal tracking and forecasting. Another interesting possibility is to set multiple targets and common goals for your team, coach the agents to success, and stay in control of your progress, and compare the work of your agents for different periods of time. Unrestricted connectivity. Copper offers RESTful API for developers to connect it to just about every system out there, but also a number of useful, premade integrations that will allow you to use it since day one. amoCRM is a smart sales automation and customer management solution for small, medium, and large companies. Its best known and unique feature is Digital Pipeline – a handy interaction tool that opens multiple online communication channels you can use to motivate buyers and move them higher along your sales pipeline. The effectiveness of your sales processes’ is further enhanced with 9 key vendor elements, including the sleek, minimalist design, automated, cross-channel prospect collection, business card scanning, email syncing, built-in-VoIP, digital ads, in-app messaging, churn control & renewal, and several handy extensions. amoCRM also comes with an easy-to-afford pricing scheme and is, therefore, a reasonable alternative for small businesses. You can easily sign up for amoCRM free trial here. Collecting leads from multiple communication channels. amoCRM collects leads from all communication channels and organizes their info on your behalf. The channels in question include email addresses, live chat, phone numbers, on-site interactions, and social media. Instant business card lodging. Part of amoCRM’s modern and successful deal-closure mechanism is also the advanced business card scanner to import and prepare your data within seconds. Complete email correspondence sync. With amoCRM, you can attach all addresses and communication history to the prospect’s profile, and have those available wherever you are. The system integrates with all leading email service providers, and you won’t be required to enter data manually. Engaging customers with digital ads. amoCRM does a very good job keeping the customer engaged, as it uses a digital pipeline to nurture leads and automate follow-up sequences. Based on it, it sends emails to targeted recipients, displays digital ads and intrigues them to learn more, which means it has basically prepared those leads for the moment they’re taken over by your sales department. Smart collaboration suite. amoCRM will offer your team multiple possibilities to exchange data and ideas across the system and work in teams to achieve the best possible results. The tool is also equipped with an intelligent notification system which makes sure no important information will slide through the crack. Base CRM is another reputed sales acceleration service that helps you analyze your customers’ behavior. It was developed as an end-to-end sales management platform that enhances pipeline visibility, puts in place seamless communication via several different channels and devices, and relates easily to other systems and applications to facilitate other key aspects of your business. It is also well known for its real-time visual reporting which helps set predictable revenue goals and accurate sales forecasts. Prospective buyers may also be interested to know that this company serves over 7,000 customers at the moment, and offers success assistance and hands-on implementation services 24/7. You can easily sign up for Base free trial here. What is unique about Base CRM? Best-in-class lead scoring. Once deployed, Base CRM covers for all of your key CRM and sales needs, well connected to your email providers, phone dialers, scoring tools, and reporting packages. For the purpose, it employs a sales tracking solution allowing you to customize sales stages according to your needs and easily track opportunities. End-to-end customer management. Base CRM keeps track of all the information, even phone calls you have with your customers and their exchanges with you. Your emails to customers can be automatically synced and sorted for easier recall and more cohesive customer relationship experience, as agents will have access to their data regardless of their devices and locations. Works in synergy with (and collects data from) popular social networks. You can use Base CRM in synergy with your favorite social networks (it collects leads from Facebook, Google, and Twitter), connect it to nearly every email service provider, and make it an integral part of your software ecosystem. Reliable customer support. Base CRM is one of the best alternatives you’ve got when it comes to customer support, as there are qualified experts always available via email or phone to answer your questions and help you maximize the potential of this system. Affordable pricing. Base CRM is suitable for large enterprises as well as for small companies, due to its flexible pricing scheme. The company offers affordable packages for startups ($25/month), and fully-featured sales kits for enterprise-grade users ($125/month). A 14-days free-of-charge trial is also available for all users interested to explore the features first. InfoFlo is Carmel Vision’s flagship CRM program and complete office management solution that puts sales managers in control over their customer database. Alongside traditional customer management features, InfoFlo delivers a modern suite of project management tools and integrates with leading phone & communication systems to ensure you will deliver nothing but the best client service. A distinctive advantage is also the possibility to gather valuable feedback and use it for your research and development, and have all information displayed at a glance for easier reporting. Future customers will also have the chance to choose how to deploy this product, as it can run both in the cloud and within your local network. You can easily sign up for InfoFlo free trial here. Enterprise-grade contact management. InfoFlo’s most valuable function is tracking, managing, and automatically linking pertinent information about your business contacts. With a single click, you will have all contact info displayed on your screen, and ready-to-share with colleagues and collaborators. Contacts are automatically imported from third-party systems and applications and can be contacted in several different ways. Email & Calendar management. InfoFlo will also take care of your email and calendar management needs, as it stores and organizes all of your correspondence, events, meetings, tasks, and recordings that matter to your business. Live social media feeds that keep you informed. InfoFlo lets you view a live feed of your Twitter, LinkedIn, and Facebook account. In addition, you can see and manage all of your posts using a single dashboard, where you will also receive customers’ questions and inquiries, and respond from several profiles at the same time. Tracking growth possibilities. InfoFlo tracks your current leads and prospects and makes sure you will never miss an important opportunity. Bulletproof data security. InfoFlo guarantees the safety of your data with an enterprise-grade 512-bit encryption and makes sure it will never fall into the wrong hands. It can also centrally backup and restore the entire InfoFlo database, including users, contacts, documents, and all other information. SAP requires little onboarding regardless of the experience you have, as the leading software provider has proven its expertise in multiple occasions, and with diverse productivity suites. This time, we are presenting their customer engagement and commerce package known as SAP Digital CRM, namely a new-age hybrid clientele solution that helps create omnichannel customer experiences. In short, this system will engage your customers at every touchpoint during their journey and maintain relationships active to foster higher repetitive sales rates. We recommend it because of its strong marketing properties, which provide for the creation of dynamic customer profiles, campaign segmentation, and best-of-breed loyalty management. Note that SAP CRM is also a system that handles revenue and order management, sales operations, support services, and various eCommerce aspects. What is unique about SAP Digital CRM? Revenue management system. SAP Digital CRM is one of the very few solutions in this category that allow you to manage and forecast your revenue based on the success of customer interactions. Using it, you will have access to order management features, subscription management tools, responsive quality control, consolidated billing and invoicing for agile charging, and end-to-end control of your finances. Compact marketing suite. SAP Digital CRM will also provide you with a compact marketing suite, and access to features such as commerce marketing, campaign management, marketing resource management, loyalty management, and detailed marketing analytics. Dynamic customer profiling. SAP Digital CRM is best known for dynamic customer profiling, as it segments customers in line with your sales logic, and helps you deliver top quality and contextual experience for each of them. The system will also make sure that information is regularly updated, and highlight important opportunities you should consider. A variety of useful commerce features. With SAP Digital CRM, you will also have access to B2B and B2C commerce tools, including omnichannel fulfillment, contextual merchandising, product content and catalog management, and many other useful features. A consistent, frictionless omnichannel experience. SAP CRM will collect leads from all channels you’re using, and then combine and present data in understandable and actionable units. This will also help you provide rich and personalized content for your customers at every stage of their journey. Insightly is another of our best rated CRM solutions for Gmail and Google Suite users, focused on building and maintaining stronger customer relationships and exceeding customer expectations. Engineered for enterprises, Insightly works ideally for social-friendly sales teams and creative companies, helping them accelerate sales and enhance project delivery across every channel. Among other benefits, Insightly will also help get the big picture of your business, as it offers top-notch dashboards and opportunity reports. Over the years, Insightly also imposed itself as the leader of CRM connectivity, working side-by-side with tenths leading sales and marketing systems on the market. Compact customer profiles. Insightly provides you with a holistic, 360-degrees view of all your contacts and customers, displaying each and every important detail such as background, contact info, important dates, email history, opportunities, and so on. Active customer engagement on all stages. Insightly features an integrated project management at every stage of engagement with the customer. This means that you can monitor recent activities and track project performance and progress against your preset timeline; create project milestones, pipelines, and tasks; set automated email alerts; and track email correspondence. Social media-friendly platform. Insightly will also perform impeccably in the role of a social CRM, as you can easily associate it with leading social media such as Twitter, Facebook, LinkedIn, Google+, and similar platforms where your contact is participating and sharing information. Micro and macro views of your business activities. Insightly will provide you with both micro and macro views of your business activities, providing access to features such as Dashboards, Tasks/Milestones, Pipeline Activity, and Opportunity Reports. Paired with an intuitive and social-friendly interface, these functionalities help boost productivity in less than no time. End-User Curriculum. As part of its advanced customer care policy, Insightly offers a class-based End User Curriculum support program ($35 per class with training materials included) intended to assist small companies into optimizing its features and adjusting the system to work exclusively for the needs of their business. Nutshell CRM targets predominantly small businesses and inbound sales teams, driven by the idea of leveraging technology power to motivate reps and close more deals. With a modern and memorable interface, Nutshell easily becomes the favorite B2B asset of every team, being at the same time an app that complements a diverse and complex software ecosystem. There is much to appreciate about it, but what you should be looking at first is lead generation: Nutshell CRMlumps all opportunities together, as it assigns people, products, sources and competitors to each lead, making it possible to track them all at once. That doesn’t stop you from distributing leads in a different way, though, or assigning unique tasks while the lead is created. Another interesting possibility is to define your own prices and adjust them to the market where your product is about to be placed. Comprehensive contact importing and organization. Nutshell CRM facilitates lead importing in a variety of ways – you can sync automatically the contacts from your Google accounts and Excel spreadsheets, bring visitors from social networks, or even create profiles manually. The system lumps all opportunities together, as it assigns people, products, sources and competitors to each lead, making it possible to track them all at once. You can also divide contacts into Leads, People, and Companies, and trigger some bulk editing when necessary. Building lasting relationships. Nutshell CRM helps bring customer interactions in the loop, and have all of their information displayed on a single page. It will automatically capture links between contacts, discover richer relationships, and populate profiles with rich social media data. Easy role assignment. The admin of this system can include as many users as he wants, and assign them different roles and permissions to govern access to information. Such features are useful foremost to larger sales teams where not all users are supposed to access customer history or pricing data. Automated syncing with Gmail, G Suite, and Google Calendar. Your Nutshell CRM account will be automatically synced with Google Calendar, and thus aggregate all important dates, and let the manager focus on managing leads. Enterprise-grade reporting. Nutshell CRM allows the user to pull out detailed performance charts, high-level summaries, sales forecasts and analytics, and team activity lists. The same as other documents exported from this system, reports can be saved to all devices as CSV files. In a fashion similar to Nutshell CRM, Nimble wraps up high-end CRM functionalities in a package affordable for small companies, allowing them to develop smarter marketing strategies, and excel in social sales. The system’s capacity relies on four main pillars: Smart Contacts, Smart Insights, Smart Results, and Mobile Applicability, all designed with the idea to provide undisturbed transparency into how your contacts are being managed. You will be able to turn to the right prospect in the right place and time and follow up his/her preferences while moving interactions in the right direction. The system is well integrated with social networks and productivity applications and has one of the friendliest mobile interfaces on the CRM market. Very detailed contact records without manual data entry. The core functionality of this platform is its end-to-end contact management, as Nimble is best known for providing detail-rich customer records. The system further supplements these contact records with data coming from Gmail, Yahoo, Outlook, Facebook, LinkedIn, Skype, Google+, email, phone, and similar sources. Touch reminders. The touch reminders, such as the Mark-as-Important staring system, are among Nimble’s best known and most appreciated features. They help keep your important communications front and center, and ensure you will never miss an important opportunity. Automated identification of key contacts. Nimble specializes in relationship intelligence and helps you identify key contacts based on their interests and preferences. Once you know which is the prospect you should focus on, Nimble helps you launch a purposeful conversation, and close deals more successfully. Social Business Insights. Nimble can also be applied for social profile matching and enrichment purposes, and provide valuable business insights on both people and companies. This way, you will have all the information necessary to categorize your prospects and reach out to them. More than 100 integrations. The open API infrastructure of this system allows you to connect it to virtually any third-party app/service provider, or use any of the 100+ default connections to different productivity systems. Nimble is automatically synced with Google Apps and Office 365 products and operates impeccably on traditional and mobile devices. Apptivo is a simple and well-integrated mobile CRM system that specializes in opportunity management. Using it, you can see a visual pipeline of all incoming deals and focus instantly on your most important prospects. The system helps to avoid re-entering data in the system, as all your opportunities are instantly transformed into goals, quotas, projects, and invoices. The very same web-to-lead tracking mechanism can be used to discover and collect new leads, as it easy to embed on your website, and comes with an open API infrastructure to blend with any of your email service providers. Plus, Apptivo gives you the possibility to customize it to your wish, be that adding new fields, sharing sections across apps, or drafting your own views. What is unique about Apptivo? Capturing web leads and converting opportunities. Once installed, Apptivo will unify all of your sales tracking systems, and integrate with your WordPress account and other intelligence sources (web-to-lead, email-to-lead, CSV import) to collect as many leads as you need to enhance your productivity. The system goes beyond traditional customer relationship management by converting opportunities into projects, quotes, and invoices. Unlimited custom fields. Apptivo stands for one of the most customizable systems on the CRM market, as it lets you add and use as many custom fields as you need. This way, you will have full control over your customer records, and you will even be able to remove automated fields that don’t correspond to your business specifications. Restriction-free customer management. Apptivo doesn’t limit the number of users you can involve, or the roles and privileges you can assign to them. You will also benefit from unrestricted storage, and insert as many relevant customer details as you need. Built-in apps for extra functionality. Rather than a plain CRM system, Apptivo can be observed as an end-to-end business management system, as its customer management capacity, is further enhanced with invoicing, project management, help desk, expense reporting, and procurement apps. Azurepath is usually described as a lead management solution, thanks to the variety of clear insights and customer stats it offers. The core benefit of this smart CRM is the ability to manage a customer’s journey beginning to end and know at any point of time where leads and accounts stand compared to weekly, monthly, or even yearly forecasts. What reps find to be the most useful feature is highlighting hot and cold leads and bringing those to their attention, making sure that no deal will slide through the cracks. Azurepath also allows batch lead editing, limitless display, and reordering of lead data, and drafts powerful, 60-seconds lead insights against minimal data input. Satisfied customers have also confirmed that it takes little to no time to abandon a traditional, spreadsheet-arranged system and upgrade to Azurepath’s professional services. What is unique about Azurepath? A batch importing feature. Azurepath is a very beginner-friendly system – it automates data entry and instantly updates your data at any time using an Excel or CSV file. Drag and drop your existing business list of accounts, leads and/or contacts to get started, or use any of Azurepath’s downloadable templates to guide you through the process. Automated communication between customer management agents. With Azurepath, you can automate communication tracking by adding cc@azurepath.com to any email, and automatically track all sales rep communication. You can also add a canned lead note in just two touches after a call or meeting, which means that manual notes will no longer be necessary. Automated lead follows up. Automated lead follow up helps you eliminate tasks and reminders – you can identify hot leads and prospective closers with a unique color coding scheme, or custom fields and alerts. Super-accurate sales forecasts. Azurepath offers automated reporting and trend analysis, which means you won’t have to build your summaries from the ground up, but have them ready-to-use regardless of their complexity. You can also come up with an extremely accurate forecast for months and years ahead, using simple sliders and Azurepath’s automated historical performance insights that guide your selections. Finance management features. Azurepath is just cut for finance departments maintaining constant contact with customers, as it offers features such as accurate cash forecasts, integrated company expenses, tracking receivables, guiding cash flow scenarios, changing prices, and so on. If looking for an all-in-one sales, marketing, and support CRM system optimized for mobile usage, look no further than Vtiger. The well-known CRM and CEM tool assemble its core functionality in three separate modules (Sales, Help Desk, and CRM), and thus makes it possible for the company to focus on improving that particular aspect of its performance that requires the most attention. Sales, for instance, provides you with a 360-degree view of your contacts, scheduled appointments, analytics, and real-time, actionable deals maps, while Help Desk section completes it with automated case creation, escalations, and proficient support. The key module is CRM, where the prospective user can collaboratively manage the delivery of customer projects, track and use opportunities, and extract valuable data for reporting purposes. What is unique about Vtiger? Fully automated workflows. Vtiger helps users to maintain their contacts, automate repetitive tasks, track campaigns, and compile an extensive report about the sales, marketing, and the support tasks being performed within the organization. It also offers custom reports that use multiple filters to focus on the specific lead characteristics. Users reduce the repetitive tasks and save time as a result. Sales, marketing, and customer support united in a single system. Vtiger is one of the few CRM performers that bring sales, management, and customer support features under the same umbrella. Hence, you can rely on this system to make your business more productive, while providing end users with top notch technical support. An array of unique sales management features. When saying that Vtiger will help you manage sales and bolster deals, we are not only referring to deal tracking and pipeline visibility. In the role of a digital sales assistant, Vtiger brings on the table a number of advanced features, including inventory management and direct payment processing via PayPal.  A support portal for end customers. As we already mentioned, Vtiger can also be applied as a help desk system. In fact, Vtiger’s backend support portal allows your customers to search through past issues and their resolutions, and find a solution for any of their problems without being involved in the process. At the back end of the portal, the support agents can create, document, and track the issues with the help of automated follow-ups. Moreover, the customers are provided with the ability to monitor the status of their issues from the opening to the closure moment. A large base of satisfied users. As an end-to-end CRM solution fully optimized for mobile usage, and an affordable replacement for several expensive sales, marketing, and help desk tools, Vtiger currently serves more than 100,000 satisfied customers worldwide. eWay CRM is a new-generation relationship manager designed specifically for Microsoft Outlook users. With an Outlook account in place, you can add the app instantly to your working environment, and make it function as a proficient, end-to-end CRM tool on a minimal price. The first action it will perform on your behalf is segmenting important clients from other contacts and then generate such from other data sources you’re using. The very same system can then be triggered for sales and marketing purposes, as it makes it easy to collect feedback, plan activities and follow up tasks, and evaluate the efficiency of your reps.
Another thing made incredibly easy will be reporting, as eWay CRM is packed with analytic features, and helps draft accurate reports that can then be exported in any desired format. The system works best for sole entrepreneurs, and small and medium sales businesses. What is unique about eWay CRM? An Outlook-exclusive CRM. eWay CRM is a tool designed exclusively for Outlook users. Thanks to it, small and medium businesses can organize their Outlook contact data, track sales metrics, and focus efforts on the most valuable prospects from the comfort of their inbox. Planning marketing activities. eWay CRM offers a dedicated Marketing module that can be used to plan all types of campaigns and marketing activities. Inside, you will find features such as mail merge, active feedback collection, efficiency monitoring and evaluation, lead generation, and many more. A dedicated Sales management module. eWay CRM targets predominantly sales and retail businesses, and thus comes equipped with sales management tools. Next to managing customer relationships, you will be able to track your deals, attach documents, notes, and emails, plan and appoint follow up tasks, or even automate different pipeline workflows. Integrated project management features. With eWay CRM, you can automate all of your workflows, and make sure no important task is left behind. All documents and customer info are stored in a single location, and there is even the possibility to track project finances and prevent potential issues. Worldwide CRM. With eWay CRM, the location of your reps and clients won’t be an issue. The system is fully functional on all geographies around the world, as it is hosted in the cloud, and imposes no territorial limitations to as who can use it. At the moment, the company serves more than 5000 small and medium businesses from all around the globe. SuiteCRM gained instant popularity being one of the very few platforms that offer end-to-end CRM service absolutely for free. The open-source alternative to expensive, traditional CRMs does an admirable job optimizing your customers and bolstering sales and doesn’t require you to invest anything in the process. You can deploy it easily in your private or public cloud, on Amazon, or even on-premise – whatever option you choose, you will be entitled to the company’s enterprise-grade customer support and onboarding assistance. A number of extensions and trendy innovations will also be available to download for those who wish to expand the platform’s scope of action. What is unique about Suite CRM? Open-source CRM. Suite CRM is absolutely free to use, and there will be no recurring fees and unexpected costs to worry about. This won’t, however, compromise the quality of the service you receive, as Suite CRM is touted to be one of the most powerful enterprise-grade alternatives to proficient CRM systems. Absolute freedom of deployment. Suite CRM can be deployed in a variety of ways: you can choose to use it in your private cloud, launch it behind the firewalls of your server for absolute security, or even acquire it as an on-demand service. The system is also available to use in public cloud, and with Amazon web hosting. Actionable customer insights. Suite CRM is best known for delivering dynamic and actionable customer insights. Such insights help businesses boost conversions and sales, bolster customer satisfaction rates, and automate cumbersome business operations. Suite CRM for developers. With a creative developer in your team, there is virtually nothing Suite CRM won’t be able to do for you. Developers are offered information and assistance to build custom Suite CRM solutions, create their own conversions, and associate the system to any third-party application. Never-ending innovations. Suite CRM has a very large user and expert community that is contributing actively to make this system even more powerful. As a result, you will always have proficient advice at your fingertips, and an ever-evolving system that caters easily to the needs of your developing business. The recent 7.9.2 version, for instance, offers a new SuiteP Email Client design, and a number of useful campaign enhancements. For more details, check the Extensions directory, and find the plugin you need. Last, but not least, we present you with a comprehensive CRM system that works best for small and mid-market businesses: Salpo CRM. This platform allows you to manage contacts, emails, deals, and customer inquiries at a fraction of the usual market price. Moreover, it helps you streamline crucial business work by providing you with pre-built integrations and a robust business rules engine. Using Salpo CRM, you can consolidate your CRM processes from collecting customer data to facilitating interactions in one convenient interface. It also allows you to get insights on your deals and make changes to your workflow without the need for coding skills. As expected, Salpo CRM is clutter-free and easy to use and performs perfectly on all desktop and mobile devices. What is unique about Salpo CRM? Robust Sales Automation. Salpo CRM comes with robust sales automation features. With this feature, you can optimize conversion rates as it helps you zero in on hot leads and determine the most opportune time to approach them. Smart Insights. The platform comes with a custom reporting module that will allow you to get real-time insights on your CRM efforts and get a better understanding of how you can further improve your strategies. Simplified Collaboration Within the Team. Salpo CRM has a unified customer database that connects team agents and lets them share files and information so that they can streamline work processes and achieve common goals. A Flexible, No-coding Structure. You won’t be challenged to update and modify this system to your needs – in fact, you can tweak functionality and add workflows on the go, and serve customers even when you’re not in the office. Deep Third-Party Integrations. This platform can easily meet your unique requirements as it can seamlessly integrate with numerous third-party applications. Be it DEAR Inventory, RingCentral, GSuite, Office 365, or other systems, Salpo CRM can easily support it.